Spring is here and it's time for our quarterly #ue4jam, but this time things are different. The Unreal Engine Marketplace has taken over, and they're bringing a slew of extra prizes and new categories! This is a great place to find team members, talk about the jam or post updates. 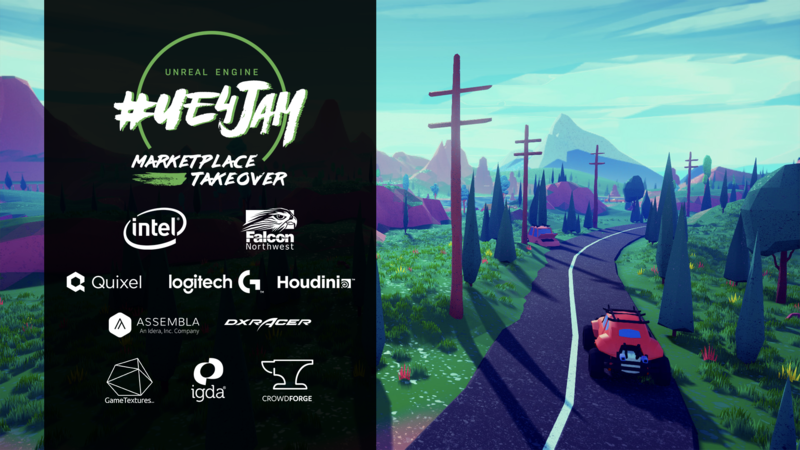 You can also head over to Discord and visit #game-jams for anything related to the jam. Happy developing, and good luck! MARKETPLACE TAKEOVER RULE: Use of Unreal Engine Marketplace assets will not adversely affect your score! Please take full advantage of the free assets available on our Marketplace, including our free featured content, Paragon assets, and more! "Ingenious" - for the game with the most innovative use of a Marketplace product. "Not an Asset Flip" - for the game with the best original asset(s) that fit with the Marketplace content. "Streamlined" - for the best game that comes in under 100mb. Last edited by VictorLerp; 04-10-2019, 06:28 PM. So really, why was this not announced at the same time as the spring sale instead of 4-ish hours before that sale ended? Why where we sellers not included and contacted related to this so we could make promo stuff around it? This would have been the best reason to interact with us, get the most out of the sales, and generally do both profitable and fun stuff. This, starting the sale the same day as 4.22 drops (which especially annoyed plug-in creators), and all the big promises to the game store (that where once made to us), just to name three recent things really makes us feel like afterthoughts. Last edited by Luos; 04-11-2019, 09:33 AM. This wasn’t announced at the same time because we were still finalizing details with some of our sponsors and not all the elements were in place. We’re excited to change up the format and will encourage folks to use MP assets they have - or maybe ones they’d like to buy during the jam. The key is we don’t want folks to feel like they need to pay to win. I do think you’re right in that we could have done more with you all ahead of time - we’ll take that feedback for future events as we’re trying new tactics. We’re still a few weeks ahead of the event, so if you’d like to do promotions around this jam, it’s not too late. Regarding the sale timing, it was not intended to launch on the same day as the 4.22 release. The teams had intentionally picked sale dates to not coincide with a number of UE initiatives, but when the release date slipped, the timing was unfortunate in regards to the sale kickoff. And we still have updates coming for Marketplace - the next refresh will come in the form of overhauling our current comments and rating system. It’s time to get busy and prepare some asset pipeline. how old do you have to be to enter? Well, the rules for jams in the past was 16, so I'm not 100% sure but I would have to assume that they are going to stay the same. Do the rules mean only premade marketplace content or all content made before? Also are all types of premade content eligible for example code and preset templates or does this only apply to art, sound, and plugins? Of course the game should be made during the jam, but where is the line drawn? It would be nice to know what assets are seen as okay. Last the thing I want to do is make a game based on a template with basic functionality I made for myself and get disqualified. I just want to clarify something regarding the size of the upload to itch.io. That butler tool is mentioned if you want to upload something larger than 1GB, but as I understand it you still need to get individual authorisation from itch.io if you want to upload something over 1GB, right? I'm not sure what their policy is, but I'm guessing they don't really want 100 people uploading 20GB files. Or does the butler tool somehow allow anyone to upload larger files? I'm guessing this is going to be a much more significant factor for a lot of people this time around, given that we can use marketplace assets. Those Paragon assets are relatively large, for one thing. Anyone able to clarify? The Contest is open to participants 16 or older who are UE4 Licensees throughout the Contest Period. Do the rules mean only premade marketplace content or all content made before? "Submission may include sourced (non-original) assets, but the sourced assets must be noted. Submission must not include assets created prior to the Contest Period (outside of noted sourced assets)"
"Sourced (non-original) assets that aren’t from the Unreal Engine Marketplace will not be reviewed and scored." Yes, you can use any content made prior to the jam (as long as it's noted in your submission) but we don't judge that content and we don't score it. This has been the case previously. The special rule for this jam is that we DO judge and reward score for Marketplace assets. Let me know if that clears it up!